Welcome to our news update page ! ChooThomas.ORG IS the Official Website of Choo Thomas / Heaven is so real. But The website ChooThomas.COM is NOT official, but has been stolen away from Choo by the web-technician without Choo's approval. YouTube video on EndTime Dreams. Click here to watch. Brother George Hagen has a new commentary titled "HOLY SPIRIT LIVES WITHIN US". You can access his commentary by clicking here. New Urgent Message. To goto Urgent Message area, click here. YouTube video regarding The Mark of The Beast. Click here to watch. Brother George Hagen has a new commentary titled "Why I Believe End Times Are Here Now". You can access his commentary by clicking here. New "Leadership Training Seminar" by Dr. Aiko Hormann held March 17 to 20. For more information, please click here. A note regarding February 7 urgent message, from Sister Choo. To goto Urgent Message area, click here. New Urgent Message from Sister Choo Thomas. To goto Urgent Message area, click here. Brother George Hagen has two new commentaries titled "CHOICES WE MAKE-MAKE US" and "IS THERE ONE GOD OR THREE?" These commentaries can be found under "Resources" or Click here. Brother George Hagen has a new commentary titled "WHAT SHOULD A PERSON DO WITH THE REST OF THEIR LIFE?" . This commentary can be found under "Resources". Seven commentaries has been added from Brother George Hagen. These commentaries can be found under "Resources". Brother George Hagen has allowed us to post the last six years of his commentaries. These commentaries can be found under "Resources". Brother George Hagen has a new commentary titled "STORY OF A BOY WHO DOES NOT YET KNOW CHRIST" . This commentary can be found under "Resources". Brother George Hagen has a new commentary titled "Are Our Present Worries Justified?" . This commentary can be found under "How to be saved". Heaven is so Real audio book. On it is only the important part of the book. The cd is one hour long. Left click the below link to listen online, right click (and choose "save target as") to download on your computer. This audio book can also be found in our "Resources" page. Brother George Hagen has a new commentary titled "JUDGMENTS OF GOD ARE COMING" . This commentary can be found under "How to be saved". Sister Choo Thomas has written an article on Sexual Immorality. This article can be found under "How to be saved"
Brother George Hagen has a new commentary titled "IS THE TRUTH OF ANY USE?" . This commentary can be found under "How to be saved". Also, Sister Lily has a wonderful testimony on what The Lord has done in her life. This can be found under "Testimonials"
Testimony from Brother Buddy in regards to a series of Rapture dreams. This testimony can be found under our "Testimonials" webpage. Brother George Hagen has a new commentary titled "DO YOU KNOW WHAT IT WOULD BE LIKE WITHOUT CHRIST IN YOUR LIFE?" . This commentary can be found under "How to be saved". A conversation with Choo. How to pray for love ones. Click here to read. New Urgent Message of The Endtimes by Sandra (Part 2). This is an audio sermon. To goto Urgent Message area, click here. Brother George Hagen has two new commentaries titled "HOW LONG SHOULD WE WAIT BEFORE ASKING TO BE SAVED" and "JOY IN LIVING OR HOW TO HAVE JOY IN YOUR LIFE" . This commentary can be found under "How to be saved". New Urgent Message of The Endtimes by Sandra. This is an audio sermon. To goto Urgent Message area, click here. Brother George Hagen has a new commentary titled "WHEN YOU FIND US GONE". This commentary can be found under "How to be saved". Brother George Hagen has a new commentary titled "THIRTY DAYS TO LIVE". This commentary can be found under "How to be saved". Brother George Hagen has a new commentary titled "Will All Christians Make It To Heaven?". This commentary can be found under "How to be saved". Brother George Hagen has a new commentary titled "What Is Wrong When We Don’t Feel the Christmas Spirit?". This commentary can be found under "How to be saved". Brother George Hagen has wrote a wonderful poem to The Lord, titled "Our Christmas Poem". This poem can be found under "How to be saved". Pastor Michael Park's Dec. 5th 2009 Urgent Message now be heard in MP4 audio. Four more translations has been added to our Dec. 3rd "Mark of the Beast" Urgent Message. The translations added are: Korean, Russian, Spanish and Italian. New Urgent Message. Pastor Michael Park has an important message regarding the Rapture. Latest Urgent Message about the "Mark of the Beast" has been translated into 11 different languages. These translations can be found at the end of the Mark of the Beast Warning. Brother George Hagen has a new commentary titled "Don’t Be Afraid to Talk About Faith". This commentary can be found under "How to be saved". Brother George Hagen has a new commentary titled "Is the World Coming to an End?". This commentary can be found under "How to be saved". Brother George Hagen has a new commentary titled "What Is Faith?". This commentary can be found under "How to be saved". The book, "Baptized by Blazing Fire" book one, has been converted into audio format. You can listen to it by clicking here. Brother George Hagen has a new commentary titled "Questions About the Rapture ". This commentary can be found under "How to be saved"
New Urgent Message posted. The Mark of the Beast and RFID. Click here to read. New Urgent Message posted. A message from Sister Sandra Sadiq. Click hereto read. Brother George Hagen has a new commentary titled "Back to Basics". This commentary can be found under "How to be saved"
Brother George Hagen has a new commentary titled "Would I stand up for the Lord?". This commentary can be found under "How to be saved"
Our thanks to Sandra for writing an article on the End Times. Click here to read. Brother George Hagen has a new commentary titled "How Can We Have God In Our Lives?". This commentary can be found under "How to be saved"
Brother George Hagen's insightful commentaries can now be found under "How to be saved"
Recommended book: "Baptized by Blazing Fire: Divine Expose of Heaven and Hell" by Yong-Doo Kim. Click here for more information. New message from Brother George Hagen, titled "Was I really living?". Click here to read. New message from Brother George Hagen. Click here to read. New message for Brother George Hagen. Click here to read. New Testimony from Jimmy in South Africa. Click here to read. We thank Jill Shannon for sharing her anointed music with us. You can listen to it byclicking here. Web Administrator's Commentary on Feb 17th Urgent Message Regarding The Rapture. Is it Biblical? Read and decide for yourself, by clicking here. A message from Brother George Hagen. Click here to read his messge. New Urgent message posted from Choo Thomas. Tribulation has already begun! Two new urgent messages posted. A letter by George Hagen about Harboring a Grudge against God. Letter posted in our "How to be saved" webpage. Music and video by Heawoon Jun available for viewing on our resources webpage. 26 new testimonials and one urgent message added to our webpage. New Urgent Message posted on our webpage. 12 new testimonials added to our webpage. It is 9 CDs for whole book. Suggested donation for the CD is $25 with postage. 24 new testimonials added to our "Testimonials" webpage. New Urgent Message added. Choo Thomas Encouragement Message regarding The Rapture. Recommended book titled "Paradise, the Holy City and the Glory of the Throne" by Rev. Elwood Scott. You can read a description of this book, by clicking here. Seven new testimonials added to our webpage. New vision posted in our "Urgent Message" section. 24 new testimonials added to our webpage. Anyone who wants to learn about how to walk a holy life and more about the end times message, please look under "How to be saved" section of our webpage. This testimony by Brother George Hagen tells how to please the Lord. "Heaven is so Real" for deaf people in American Sign Language is available for viewing and download at our resources page or by clicking here. We like to thank Sister Melinda for all her hard work on this project! Two exciting testimonials added to our "Testimonials" webpage. 17 new testimonials added to our "Testimonials" webpage. Resources section has been updated with "Retha's Hope Testimony and her 12 year old son's Heavenly vision" in audio. New Urgent Message added. Revelation of Heaven and Hell by 7 youths. New message added in our Urgent Message section and 26 new testimonials added to our Testimonials section. New vision posted in our "urgent message" page. 3rd vision from Renessa posted in our "urgent message" page. "Heaven is so Real" devotional book and Gospel songs by Johan Claassen added to our resources webpage. 15 New Testimonials Added to our webpage. Warning on the mark of the beast 666 added to our "Urgent Message" area. Two new visions added to our "Urgent Message" area. 8 new testimonials added to our website. A new book has just been released by Creation House. It's called "Christians Going to Hell" by pastor Seung Woo Byun. I (Choo Thomas) believe every Christian should read it and examine their salvation. For more information, click here . Our testimonials page has been updated. Soon, we will release a new documentary video called "The Bible: The word of GOD ? Extraordinary Claims Demand Extraordinary Evidence." This video will provide compelling evidence that The Bible is "The Inspired Word of GOD". Prayer List added in our resources page. Two new messages added in the "Urgent Message" area today. We want to wish everyone a Happy New Year ! Given the importance and urgency of Choo's message, we are now letting the entire "Heaven is so Real ! A testimony of Choo Thomas" be downloaded for free. The video is 38 minutes and 78 MB. The downloadable versions are in English, Chinese (Mandarin) voiceovers, and Spanish voiceovers. The downloads are located in our "Resources" area or you can click her . All new orders of Heaven is so Real DVD will now include Korean and Mandarin voiceovers. Heaven is so Real DVD will soon have Korean and Mandarin voiceovers included. Heaven is so Real, Spanish Book, is now ready for order. Click here for more information. 800-987-8432 IN THE USA AND 407-333-7117 INTERNATIONAL ORDERS. New radio button added to ChooThomas.org entitled "Urgent Message"
All new orders of "Heaven is so Real" DVD will have English, Chinese, Korean, German and Japanese subtitles. Also, 100 more copies of "Heaven is so Real" Chinese book is in stock. 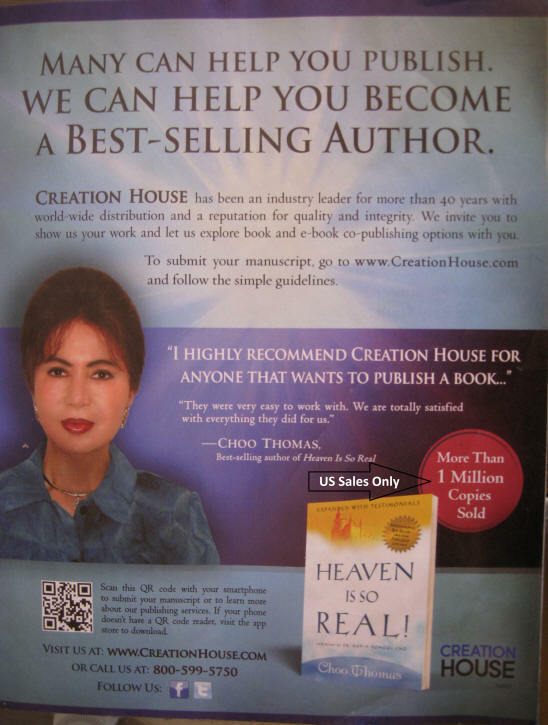 "Heaven is so Real" Chinese book is ready for order in our resources page. Limited quantities in stock, but 100 more on order. All new orders of "Heaven is so Real" DVD will have English, Korean, Japanese and German Subtitles. It will also contain almost 1 and 1/2 hours of singing by Sister Choo on a separate track. In the next few days, "Heaven is so Real" book, in Chinese, will be ready for order on this site. The Korean webpages of ChooThomas.org has been updated. New HISR DVD orders starting June 27 will have Sister Choo's singing on it, in a separate track. Her song is one and one half hours long. Note: All media downloaded on this site is licensed under a Creative Commons License.